She's wearing such a beautiful garment! Love the detail of the shoe falling off. Very nice piece! Absolutely love this. Beautiful illustration. What a gorgeous illustration! She's like a sleeping Cinderella. Very playful and beautiful! love the slippers flying off! That is so cute!! It makes me smile!! What a beautiful, illustration very magical. It's so magical and whimsical to boot! I love this. Your style is wonderful! Oh I am in love with your world. It makes me feel welcome. Thanks! 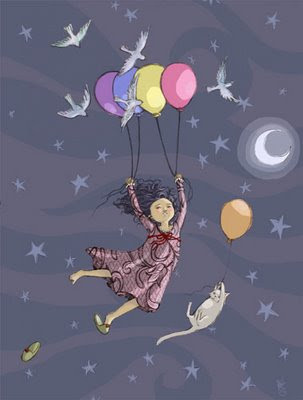 What a wonderful, fun and carefree energy you've created with this illustration. It is magical! O love your second one (distress) too. Great movement!! OHHHHHHHHHHHHHH, Sara, it's just magical. It calls out for a story to go with it. I love it!! !